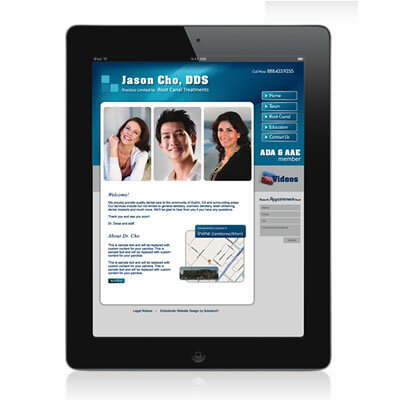 Solution21, Inc is a provider of website and marketing 'solutions designed for healthcare professionals including dentists, 'dental labs, cosmetic surgeons, chiropractors, optometrists, physicians, 'orthodontists, endodontists, oral surgeons, pediatric dentists, 'periodontists, and other healthcare professionals. Providing exceptional 'personalized service and competitive packages are a hallmark of the 'company. Solution21, Inc is knowledgeable about dentistry and other medical professions and 'have streamlined the process to minimize the amount of time needed to 'spend on each website and marketing project. Solution21, Inc's focus is on bringing 'the maximum number of new patients to medical or dental practices by 'developing the best websites and marketing programs.' With years of experience in website design and marketing, Solution21, Inc is 'confident that, given the chance, they can provide practices with 'exceptional service.